The ankle (talocrural joint), which connects the foot to the leg, is basically a hinge joint. It consists of three bones, the talus underneath, and the lower ends of the shin-bone (tibia) and outer leg-bone (fibula), which sit quite snugly over the talus in an inverted U shape. The talus is situated above the front part of the heel-bone (calcaneus), and those two bones form the subtalar joint under the ankle. On either side of the ankle you can feel the bony end points of the two leg bones, called malleoli. The medial malleolus is on the inner side, the longer lateral malleolus on the outer side. The joint is held together within its fibrous capsule, which is lined by the fluid-producing synovial membrane. The capsule is strengthened into strong ligaments on either side of the ankle, the medial deltoid ligament on the inner side, and the lateral ligament on the outer side, part of which protects the back of the joint. The front of the joint is the least protected. The shin-bone and outer leg-bone are bound together above the ankle by the inferior (lower) tibiofibular ligament. 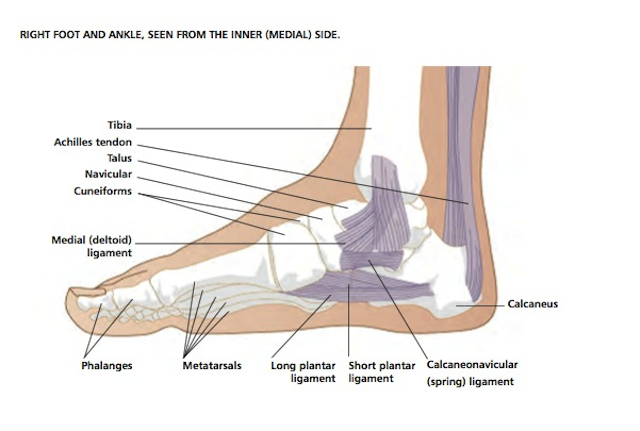 Tendons surrounding the ankle, besides creating the ankle’s movements, act to stabilize and protect it. The ankle has a rich supply of proprioceptive nerves, which provide in-built awareness, and send messages to the brain about the joint’s position and activities. These messages are vital for your balance mechanisms when you are standing or moving about on your feet. You can point your foot downwards from the ankle, in plantarflexion, or upwards into dorsiflexion. Done against gravity or your bodyweight, the downward movement is effected by the calf muscles (mainly gastrocnemius and soleus, with other posterior tibial muscles), while the tibialis anterior on the front of the ankle is the main force in the upward movement. Although the ankle has a slight degree of sideways and twisting movements when the foot is pointing downwards, these are mainly accessory movements, which you cannot perform actively, at will. Twisting rotation movements are done in the subtalar and foot joints, not the ankle itself. When you stand still, the line of gravity falls just in front of your ankle joint. There is a constant adjustment of postural muscles to keep you upright, especially the soleus muscle at the back of the leg. When you walk, run or jump, the ankle is the link for movement and shock absorption between your foot and your lower leg. The load of your bodyweight is transmitted through the shin-bone on to the surface of the talus. The outer leg-bone does not bear your bodyweight, but moves very slightly outwards as your weight goes forwards over the talus. If your ankle is stiff, more work has to be done by your foot and other parts of your leg. The shock of landing can even be transmitted right up to your lower back, if you jump down from a great height and your ankle can’t give normally to absorb it. This is why restrictive taping, which interferes with both the ankle’s movements and its proprioceptive mechanisms, should not be used for sports. Ankle taping can easily lead to injury, while its supposed value in preventing injury is dubious. If you twist your foot and ankle forcibly, the ankle can be sprained: the ligaments on either side can be strained or torn, and the injury can involve the subtalar joint and the malleoli as well. A severe force causes fractures in the bones of the ankle. 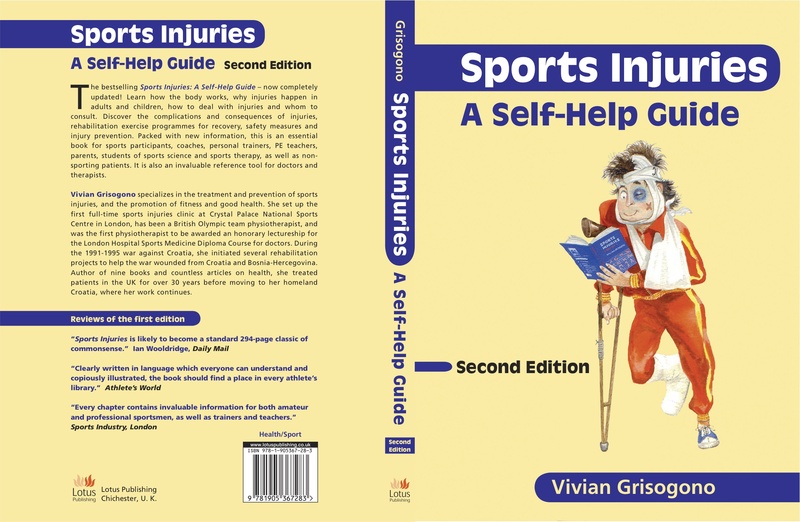 A really bad injury can cause fracture dislocation. Overuse/abuse of the ankle can cause microtrauma in the bone surfaces, especially of the talus. Stiffness and limitation of movement in the ankle can cause overload on the loadbearing surfaces, and can lead to osteoarthritis (wear and tear degeneration). Following relatively minor trauma, the ankle can be affected by reflex sympathetic dystrophy, which causes acute pain and discolouration, among other symptoms. If pain and swelling happen through no obvious cause, they can be due to infection, gout or food intolerancefood intolerance reactions. Circulatory problems and referred pain from the back can also affect the ankle.